Combining signal fidelity with an architecture that maximizes speed in every performance aspect, the new WavePro 7 Zi Series presents a totally new oscilloscope experience from 1.5 to 6 GHz bandwidths. Experience 50 Ω and 1 MΩ inputs for every channel and four inputs into high-speed front end amplifiers and analog to digital converters. Experience the new X-Stream II architecture that provides 10 to 20 times faster long memory performance than any other oscilloscope. Combined with LeCroy’s flexible and deep analysis toolbox, the WavePro 7 Zi Series gives an unforgettable experience for the debugging, validation, analysis and compliance testing of electronic designs. WavePro 7 Zi excels in the way it offers general purpose utilities never before seen in oscilloscopes from 1.5 to 6 GHz. 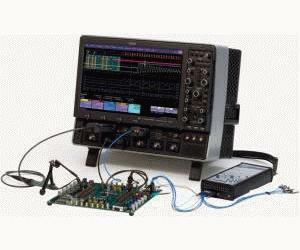 All WavePro 7 Zi oscilloscopes contain selectable 50 Ω and 1 MΩ input capability. The 4 and 6 GHz models include both ProBus and ProLink input types, which means eight probes can be attached and then multiplexed from the front panel or by remote control. The result— it is easy to hook up a passive probe even on 4 or 6 GHz models—no more frustration and hassle of trying to find a 1 MΩ input adapter. Plus, any existing investment in LeCroy probes, such as current probes, single-ended or differential active probes, or high voltage probes, is fully leveraged. A powerful combination of high bandwidth Edge and 10 different SMART triggers allow you to isolate the problem quickly and begin to focus on the cause. Most SMART triggers allow triggering on pulse widths or features as small as 200 ps. A high-speed serial trigger enables triggering on up to 2.7 Gb/s serial patterns of up to 80-bits in length. Built-in hardware clock recovery is also included. LeCroy has found a way to make long acquisition memory seamless and pain free to use. The WavePro 7 Zi Series’ proprietary X-Stream II architecture supports capturing, zooming, measuring and analyzing multiple waveforms at 256 Mpts deep. What you experience is performance gains of 10–20X over what is available today. Whether looking at the acquired signal or while analyzing several screens of statistics, tracking a frequency or identifying complex patterns the WavePro 7 Zi is designed to perform.